Mangaluru, Mar 26, 2015 : Olympian Sahana Kumari is determined to set a new national record in her native city here in the four-day Federation Cup National Senior Athletics Championship, 2015 to be held at Mangala stadium from May 1. Ms. Sahana, who holds the national record in the women’s high jump with a leap of 1.92 m, honed her skills at this stadium. A jump of 1.89 m at the event will help her qualify for the 21st Asian Athletics Championship at Wuhan, China, this June. If she manages to jump 1.92 m, she will qualify for the 15th World Athletics Championships to be held in Beijing in August. 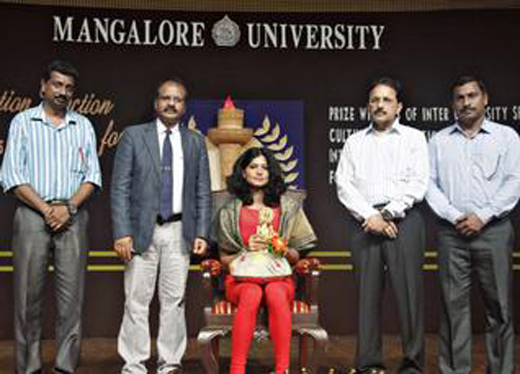 Ms. Sahana was at the university to attend a felicitation function for prize winners in inter-university sports and cultural competitions and inter-collegiate sports championship of the university for 2014-15. Ms. Sahana, mother to a nine-year-old daughter, said that when she was into sports in school and college. “Women are not meant for the kitchen. They should come up to show their talents,” she said. The love between Ms. Sahana and her husband, national-level sprinter B.G. Nagaraj, blossomed in Pakistan years ago. She said that they were in Islamabad in 2004 to take part in a South Asian athletics meet. After she lost in the high jump, she could not control her emotions and broke down. It was Mr. Nagaraj who consoled her then. The consolation finally turned into love and ended in marriage. The love between Olympian Sahana Kumari and her husband, national-level sprinter B.G. Nagaraj, blossomed in Pakistan years ago. Narrating this at Mangalore University on Wednesday, she said that they were in Islamabad in 2004 to take part in a South Asian athletics meet. As she lost in high jump, she could not control her emotions and broke down. It was Mr. Nagaraj who consoled her then. The consolation finally turned into love and ended in marriage.